US takes gold, silver, and bronze in woman's fencing! WOOOOT!!! You realise not everyone on the forum is in the US? I can't wait to watch the Finals of both Athletics and Football! Speaking of Football, the attention is now focused on both Argentina (men's) and the United States (women's), the defending gold medallists. The question is - Are they able to recapture their titles at this year's Olympics? We will find out. Modern saber technique in my opinion has the least actual amount of "fencing" in it of the 3 weapons. When an American gets a medal for foil or epee' then there will be something to shout about. But probably not in this lifetime. One of the nice things about myArmoury is its international membership. I imagine most Americans on here would agree that the non-American perspectives are often quite fascinating and educational. That being said, I doubt Mr. Chesser was trying to slight anyone. I will applaud the Americans, the UKers, the Chinese, the Antarcticans, even the Martians -- makes no difference to me. If they earn an Olympic medal, that's worthy of a hats-off in my book. Modern saber technique in my opinion has the least actual amount of "fencing" in it of the 3 weapons. The saberists (sabreurs?) in my fencing club might argue the point, but personally, I'm inclined to agree with you: As I've seen it, saber is the messiest, roughest, least elegant division of modern sport fencing. Epee and foil, to my thinking, at least attempt to reflect their rapier-and-smallsword heritage. Now I'm going to hide behind my fencing mask while you saber people throw stuff at me. Fencing is really the only Olympic sport I'm interested in. Unfortunately, I keep missing it. Correct me if I'm wrong, but isn't the epee the most recent addition? As I heard, it was introduced in modern times and never actually evolved out of an older dueling style like the foil and saber did. Hmmm, now you've got me second-guessing myself. You may well be correct; I've not made an in-depth study of the sport. According to a book I read a while back, saber fencing evolved from cavalry saber technique; epee evolved mostly from rapier and then smallsword; and foil evolved from what I understood to be a practice weapon for smallsword. This could be completely wrong, of course. Perhaps the book and/or myself are misinformed. 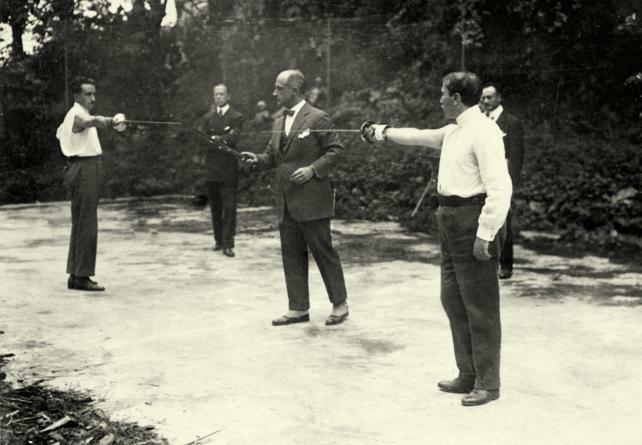 The Epee was a later introduction, but by later, we still mean around 1900. The dichotomy of the foil and the epee did not really exist in the Italian school until adopted from the French. Up to this point, learning fencing in the Italian tradition involved learning the Dueling Sword and the Saber, and in both of these, the practice weapons were pretty much only blunted versions of the real weapon. The French, OTOH, had a pretty clear distinction between the practice foil and the sword they used for dueling, which was eventually optimized to protect the hand (i.e. the large bell guard of the Epee). However, by the early part of the 1900s, the Italians had adopted the Epee as well, and the second edition of Parise's fencing treatise included a section on the Epee. Thus, by 1910, if you went into pretty much any sala or salle, you most likely would have been exposed to all three weapons. Neither the modern Foil nor the Epee is directly descended from the Rapier. Instead, the French weapon lineage goes through the smallsword (which did descend from the rapier); the Italian lineage goes through the dueling sword (which also descended from the rapier). Thanks for the info -- that certainly clarifies things. "The saberists (sabreurs?) in my fencing club might argue the point, but personally, I'm inclined to agree with you: As I've seen it, saber is the messiest, roughest, least elegant division of modern sport fencing. Epee and foil, to my thinking, at least attempt to reflect their rapier-and-smallsword heritage." My issue with sabre is at the highest levels its mostly just a matter running down the strip, screaming, slapping the opponents blade to get priority, hitting once and then stopping to look at the Director. Ghastly! No phrasing, 2nd or 3rd intention or anything. The mens sabre is no different. The young girl from Tunisia displayed more fencing skill than anyone else. Her opponent was almost at a lost as to what to do. It was the only enjoyable bout all night. My issue with sabre is at the highest levels its mostly just a matter running down the strip, screaming, slapping the opponents blade to get priority, hitting once and then stopping to look at the Director. Ghastly! No phrasing, 2nd or 3rd intention or anything. "Ghastly," sir, is a very good word. I'm no great fencer by any stretch of the imagination, but the run-smack-scream technique that seems so prevalent in saber is just one of those things that really bugs me -- is a little finesse too much to ask for? But I don't want to rant about personal pet peeves, so I'll just be quiet and go play with my epee. Well, i think Morgan Butler's characterization is a gross exaggeration, but i don't disagree with the spirit of his assertion. To be fair, the state of modern saber fencing is not the fault of its players...after all, you do what you must to get the point! The problem stems from the fact that the fencing saber is the lightest and flimsiest of all the fencing weapons. As such, its use is the most divorced from the weapon it is supposed to be simulating. It is so incredibly quick that you must resort to direct attacks...the director either won't see anything more complex, or your opponent won't, so they won't respond to it! Give the fencing saber more mass and you must drastically increase the amount of protection worn...it's a tough call. That issue applies to all three weapons of sport fencing. Even epee (my own weapon) is a far cry from accurate combat techniques. I've learned to accept this. Pistol grips, flicks, etc. I am resolved to take up strict classical fencing as soon as it's geographically feasible. On another note, the one bout I caught was the final women's foil, between an Italian and a Korean. Ended 6 to 5 Italy. Great bout. Kept me on the edge of my seat until the final second. And I then had to explain right of way to all the non-fencers in my office. I'm the first one to say that sabre is very far from its historical counterpart. But that said, I also don't think its fair to point our noses up to anyone who wins a medal in the sport, *especially* at the Olympic level. It takes an incredible amount of athleticism, speed, agility, timing and, most of all, dedicated training. Its quite a huge accomplishment to win in the Olympics. Had the UK won (or any other country, for that matter), and someone posted about being excited about it, I don't think you'd see anyone offended here. "The problem stems from the fact that the fencing saber is the lightest and flimsiest of all the fencing weapons"
The new sabers are stiffer and more solid than the old ones, this was done to improve the game, but it did little. However it is a sport and sports have a way of evolving into esoteric techniques. Sort of like Ken-jitsu and Ken-do. One is "fighting with the sword" and the other is "the way of the sword." Both are good. I enjoy both rapier/smallsword and modern foil. I find it to be more holistic. Accent on the "whole". I certainly dont mean to demean the players, to be an Olympian is a huge accomplishment.....even in sabre. lol. Just to be quite certain that I didn't step on any toes: I never meant to imply that foil and epee were inherently superior to saber. To each his own. The significant gap between historical fencing and sport fencing has bothered me for some time now. I actually only took up sport fencing because it was the closest I thought I could get to swordplay. I didn't know that there were groups of other people as obsessed -- I mean, as interested -- in swords as I was who practiced historical sword fencing. I have found fencing, particularly epee, to be highly enjoyable, but I can never quite forget that it's only based on historical sword techniques. This has left me with a strong desire to at least investigate classical fencing -- after I've found someplace that offers it and isn't hours away, and after I can make the time and money to put into it. It is a very great thing for the sport of fencingin the US that the US. 20 some odd years ago I remeber listening to the heads of fencing community fencing tournaments dream about winning something, anything to help put fencing get into mainstream America. It is a great accomplishment. The problem with olympic or sport fencing lies not in the fencers, but in their coaches. As long as the coaches continue to allow their students to executes things like the "flick-hit" and have bad form and sloppy technique then it continue to remain unappealing to the general public, as they cannot discern actions nor phrase des armes (neither can most of the directors nowadays for that matter. But then again it neither entirely the coaches fault either, the ruling association , who, in desperation for perpetuating the sport that enthraled them when they were young, what fencer cannot say that they never watched Errol Flynn when they were young?, seek the quickest methods for producing medal winners, thereby achieving noteriety and money to continue to run a fencing programs allow those very "producing techniques" to wittle away interest for the very sport that they love. Else why would the Masters program at San Jose State exist? Those same masters abandon olympic fencing because it betrays the skills that they have learned. Make sense? My humble opinion is to get rid of electric scoring, make the weapons more rigid and heavy or bring back the old form qualification to enter ranked tournaments. But I still love to watch a good bout! P.S. I would hold that any olympian if given a real rapier would still clobber any of us in the historic, classical, or WMA world, simply because of their massive training. What could we all become if we really spent the first year entirely on footwork? and the next 5 years perfecting our form and technique only under the hand of a fencing master? P.P.S Sorry if that sounded more like a rant. I am just trying to say the most in the least possible time. There's tons written about our very dilema at hand. I have to hurry and go move tomato plant before dark! Having spent some years fencing, admittedly many years ago.....ahmmm, I just wanted to throw in a point or two, pun intended! I can quite agree with Morgans point regarding the sabre being the weapon with the least fencing type skill to it. However, as my understanding of it is that it was descended from the cavalry sword, and used on horse back, the idea of attack, parry, reposte, parry, reposte, parry, repries of the reposte etc. is not quite so relevent to this weapon. Personally it was my favourite weapon, though regrettably never at the level you are talking about, though I did fence with many members of the English training squad at the time......and always got beaten! And regarding the epée , again as my understanding of it is/was, being descended from the duelling weapons there were no fancy rules, no right of way, no 'off target' etc. It was a somewhat cruel, occassionally crude, but effective way of using a sword , especially when your life depended on it. We by the way, occassionally used to use a 'point Garry', which had three fairly sharp points at the tip, which hurt like hell, when run down an advancing unprotected shin, or accidentally went up a sleeve! But it was a good and effective way of learing the sharp brutality of the weapon, and where it evolved from! Foil, well, I always found it incredibly boring, a necessity, but boring. Probably because I was so ham fisted at it, perhaps. But given an epée or sabre that was a different matter.....................great fun. I can quite agree with Morgans point regarding the sabre being the weapon with the least fencing type skill to it. However, as my understanding of it is that it was descended from the cavalry sword, and used on horse back, the idea of attack, parry, reposte, parry, reposte, parry, repries of the reposte etc. is not quite so relevent to this weapon. Actually, that's a bit of a fencing myth. It is based off of the duelling sabre, not the cavalry one, which was fought on foot. Classical sabre is essentially the same thing as duelling sabre. The whole "not hitting below the belt because you'll hit the horse" thing is also a myth. If you ever get the chance, I highly recommend reading Christoph Amberger's Secret History of the Sword, which touches on this matter (and a number of other really good sword myths). Actually, the sport form of sabre is descended from the dueling sabre and believe me, it carries the whole idea of parry-riposte and all of the skills of the other weapons (or did)--thus, the old approach was to learn foil first. That is, to be a good sabreur requires that you first learn all of the skills of foil and then learn the additional skills of sabre.